For the past three weeks I have been using Chosen Foods Avocado Oil for roasting, sauteing, slow-cooking, marinades, and even in our smoothies. Previous to this, I was using canola oil because of it’s high smoke point and because my son has multiple food allergies which limits our safe choices. However, the majority of canola oil available in the US is genetically modified and every time I reached for the bottle I would cringe. 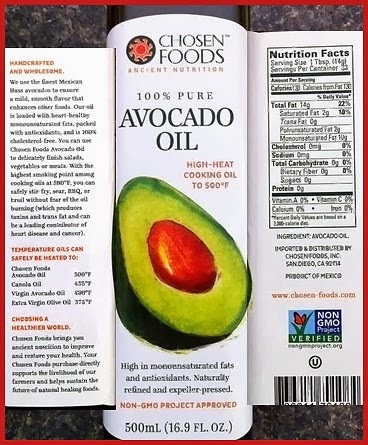 Chosen Foods contacted me asking if I would be interested in a product review program, specifically for the Avocado Oil. They sent me a complimentary bottle of oil in exchange for an honest review. We use a lot of oil in our house because of allergies to dairy and soy. Our nutritionist also suggested that we add oil to our son’s diet as a fat supplement because of his limited diet. I was really looking forward to finding a healthy alternative to canola. Canola is high GMO, Olive Oil has a strange after taste and smell, Coconut Oil my son does not like (he used to test positive for coconut and has never liked it since we added it back into his diet), Peanut Oil is out due to allergies, Vegetable Oil is also out due to allergies, Corn Oil is high GMO. Can you see why I was excited to try Avocado Oil?? It is packed with omega-9 (monounsaturated fatty acids), phytonutrients, and antioxidants. After using Avocado Oil for the past three weeks it’s pretty safe to say that we’ll be switching from canola permanently. I loved the taste (or lack of taste) of the avocado oil and no one in my family complained about it or refused to eat it. I used it every day and in many of my recipes with no problems. What kind of oil do you use? Are you happy with it? If not, try making the switch to Chosen Foods Avocado Oil. I did! P.S. If I didn’t like the oil my review would only state facts about the oil. I promise to always honestly review all products submitted to me. If I say I like it, I do! Promise!! I was not paid to review this product. I did, however, receive one complimentary bottle of Chosen Foods Avocado Oil. I found that chosen foods avocado oil is refined. this kind of oil is not healthy because the way it is processed. a truly healthy oil is one that is extra virgin and cold pressed. I certainly will not buy it again.